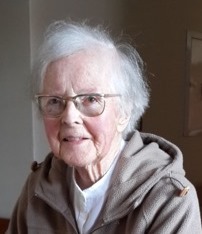 This is the Vocation Story of Sr Elizabeth Clifford O.P, a Sister of the Congregation of Dominican Sisters, Cabra working in South Africa. My parents, being practicing Catholics took me to Mass with them on Sundays. We attended a Jesuit Church “for the good sermons” and after Mass my father would quiz me about what I had understood of the sermon. At the time, I did not know this, but they had many a good laugh at my answers, because I always had an answer even though it might not be the right one. I remember one Sunday the Gospel was about the cure of a leper and my father asked me, “What is a leper?” I said, “A man who keeps leaping around – he can’t stop”. I was quite sure that was the meaning of it. Another time he asked me about the prayer – “May the Divine assistance remain always with us”. “What’s the meaning of ‘assistance?” I said, “The Saints of course – like shop assistants”. I listened hard to the sermons and made up many answers (if I did not know the answer, I made up an answer). As the eldest child I was often left alone because after me there were two boys and they had their own amusements. I would sit on the garden wall and think – my father called it ‘moping’. I would think about some word that I could not understand. The first word was ‘Infinite’ which I heard somewhere. After a session of ‘moping’, I had a sudden intuition – I was crossing the grass to enter the house – “it meant something very big that you could never finish counting” and when my mother was talking to another woman about the first prize in the lottery which we called the ‘Sweep’ in Ireland, I remember saying to myself, “That’s nothing, it’s not infinite. It will come to an end”. Only what was infinite was worth winning. My mother prepared me for my first Holy Communion. I had just turned eight. It was a Sunday morning and I was alone with my parents. My father looked up the feast for that day and he told me it was St Valentine’s Day. I knew that there was something special about the day, and I have celebrated it on the anniversary every year since. It seemed like a consecration. There was talk about St Thérèse of Lisieux at the time and I liked her a lot, but I never wanted to be a Carmelite, though I knew I would be a nun. When I saw nuns on the street, I would stare at them hoping they would smile, but they never did. It was 1932, the year of the first Eucharistic Congress in Ireland and we went to the concluding High Mass in the Phoenix Park and afterwards there was a Missionary Exhibition where the various Missionary Congregations had their stalls. They told us about their missions – in the Far East, in Africa and elsewhere. I decided I would be a missionary and go to Africa. I never lost this desire though I knew very little about Africa, just that it was very hot there! I was still at Primary School at this stage. It took me thirty years to come to South Africa. When it was time to go to Secondary School, my father talked to his friends about the choice of school for his daughter and one particular friend advised him: “Some Convent Schools are known for producing young ladies, but if you send her to the Dominicans she will learn her Faith”. So to the Dominicans I went. At high school, the day was begun with the first class being “Christian Doctrine” and this class was never omitted for any reason. It was clearly the most important subject of the day. One day the Sister in charge of the twelve year olds called me aside and said “I’m told you have a friend at Bertrand School”. (This was a small Protestant School on our street). I told Sister that we were a group of school girls who came to school on the country bus from Celbridge. When we reached the city we all got out and headed for our respective schools. The other girls went south to their schools while Doris and I went north. “Where are you going?” she asked. “To Eccles Street” I said. “So am I. Let’s go together” So Doris and I walked to school each day otherwise she’d be alone. I told this to Sister and she smiled. “You are doing right” she said. “Don’t let anyone stop you”. I found that the Sisters were very open and broadminded and trusting. It was not just one Sister but the spirit of the Community that attracted me. Towards the end of my Leaving Cert year my mother and I were making beds when I began to tell her about the Sisters. “Do you want to join them?” my mother asked. “I do mama”. And that was that. Later I realised that it was the spirit of St Dominic; in the words of St Catherine, “joyous and broad “- and free!